An island off New Caledonia, in the Coral Sea, has disappeared. 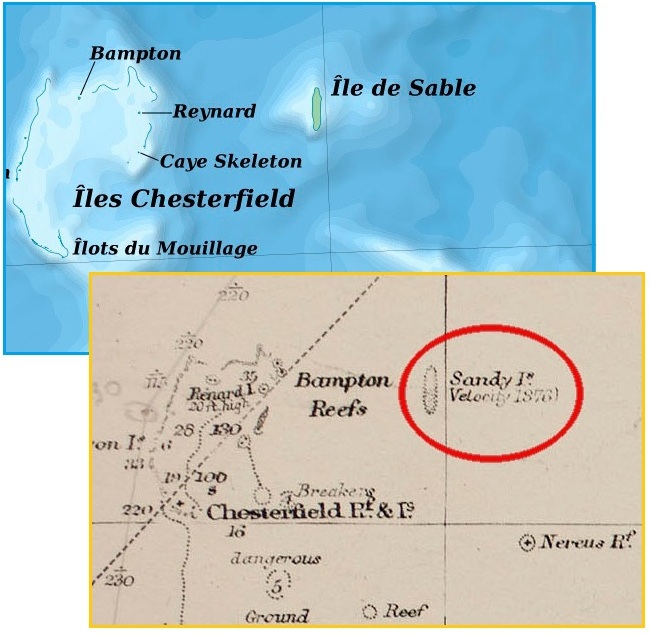 Sandy Island has been on shipping charts for over a century, and showed up on Google Earth images taken by satellite also, until very recently. A 1908 Auckland Museum map indicates Sandy Island in the Coral Sea was discovered by the ship Velocity in 1876. The missing island hit the press in the UK, articles appearing in the Daily Mail, the Guardian, the Independent, and the BBC. A tiny island in the Pacific which appears on a range of maps seems to have disappeared without a trace. 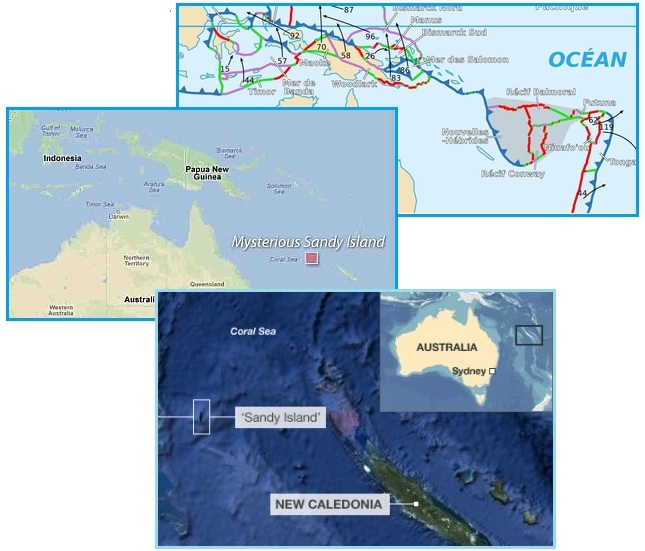 Australian scientists who went in search of Sandy Island - which appears midway between Australia and the French-governed New Caledonia on Google Earth among other world maps - found nothing but sea when they arrived. The Times Atlas of the World appears to identify the sizeable phantom island in the Coral Sea as Sable Island, and weather maps used by the Southern Surveyor, an Australian maritime research vessel also say it exists. Scrambling to explain the disappearing island, the establishment came up with every excuse but the 7 of 10 plate movements predicted by the Zetas, and the plate undulations that can occur during these adjustments. ZetaTalk Explanation 12/1/2012: We have explained that as the Indo-Australian Plate rises on its eastern edge, where eastern Australia and New Zealand lie, that temporary undulations will occur in weak spots on the crust. The eastern end of the plate is heavy, so the first reaction is to bend in the Coral Sea, which is suddenly jutting above the magma level. This puts stress on the bend point in Australia, which also begins to bend. The second reaction is for the flex point in the Indian Ocean between Australia and India to allow the plate portion holding India to drop on its southern end, bringing Sri Lanka down. This allows the eastern end of the Indo-Australian Plate to straighten out, so the temporary bend in the Coral Sea region disappears. During such times, the floor of the Coral Sea will flex up when the plate is tilting again, then relax somewhat as the magma fills in and again supports the void, then straighten out as the bend point between Australia and India allows Sri Lanka to drop, then disburses and redistributes the magma under the Coral Sea which now has once again changed shape. The crust under the Coral Sea is not smooth, but is as irregular as the crust visible to man. There are mountains and valleys, places where magma can get trapped or swirl, creating currents. Thus at times the Coral Sea floor will be lower than previously, although this too is likely to be temporary. For Sandy Island to disappear, temporarily, is thus logical. The Zetas addressed the bends in the Indo-Australian Plate earlier, on November 27, 2010 when they described several bend points in the plate – between India and Australia, within Australia itself, and in the Coral Sea. In Issue 219 of this newsletter on December 31, 2010 when they presented the concept of a magma void under the Coral Sea causing a temporary droop. And in Issue 223 on January 16, 2011 when they explained the relationship to a heaving and dropping Coral Sea to the flooding in eastern Australia, the rivers backwashing at the time. ZetaTalk Explanation 11/27/2010: The Indo-Australia Plate bends in several places, as the tilt that this plate is forced to assume, being driven under the Himalayans, is extreme. Australia bends through the lowlands, as we have described, bending such that the eastern part of the Indo-Australian Plate can rest on magma and not just jut into the air. 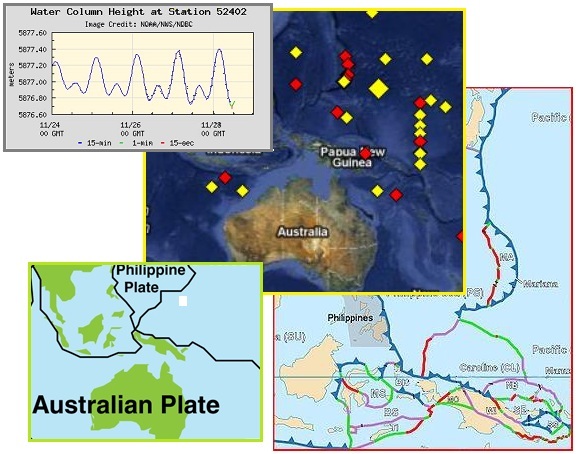 As we explained, the Indo-Australia Plate is assumed by some to be two separate plates - one for India and one for Australia - because of a bend point in the center of the Indo-Australia Plate. But the plate operates as one. The Coral Sea also is a weak point in the plate that is already bending of late. ZetaTalk Explanation 12/31/2010: What has occurred is a deeper adjustment in the magma flow under the plate, where the Coral Sea bulge dealt with a temporary situation. The magma flow is now sweeping under this tilted plate, thus relieving the weight of the eastern edge of the plate so the Coral Sea can relax. ZetaTalk Explanation 1/15/2011: It's an iterative process. The curve under Sumatra and Java rises, causing the Coral Sea floor to rise, rushing water onto Queensland. Then magma fills in under the eastern end of the Indo-Australian Plate so the Coral Sea bend can relax, allowing water to rush back and halting, temporarily, the tipping process. Then it all starts over again. Buoys reflect this process to an embarrassing degree, and like the disappearing Sandy Island, are something the establishment cannot explain without admitting the 7 of 10 plates movements predicted by the Zetas. All this of course leads to the presence of Planet X, so buoys indicating a rising or falling sea floor are a problem for the cover-up. Note the obvious gyrations in the Coral Sea in early January, 2011, a rising sea floor at that time. What to do? Kill the buoys. 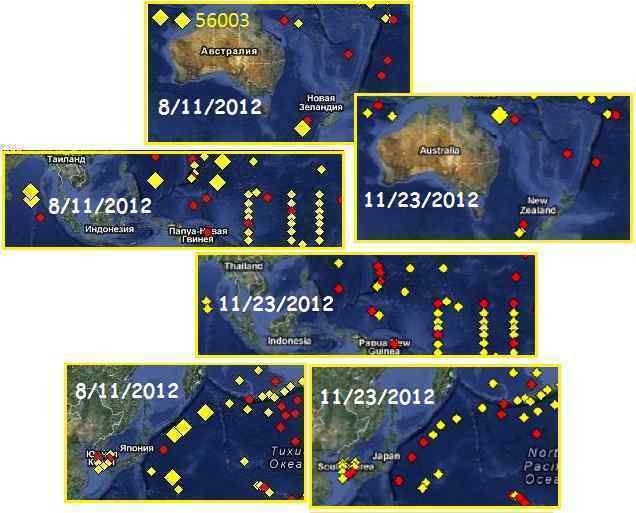 Note how many buoys had been taken offline in the Pacific between August 11, 2012 and November 23, 2012 along the coast of Japan, in the Coral Sea, and in eastern Indonesia. 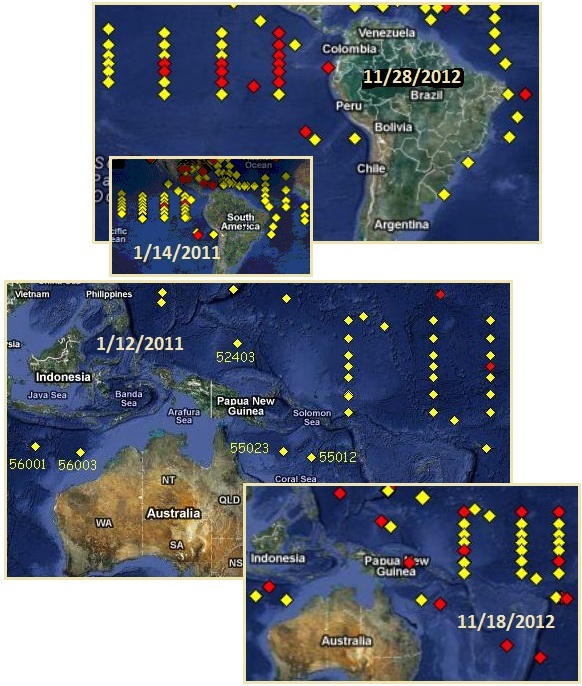 Note the huge number of buoys taken out of service west of S America. Can there be no doubt that the S American role has changed the sea level depth, and set the buoys to bobbling above the Nazca and Cocos Plates west of South and Central America? And the South Pacific is compressing too. Per the Zetas, it is not that the buoys are broken and in need of maintenance, but that their reports are difficult to explain unless the plate movements are admitted. 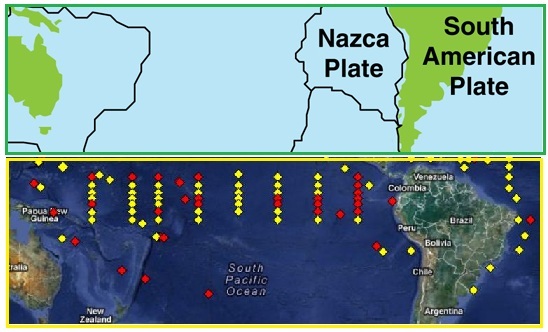 They suggest looking to decommissioned buoys, those in red, to see where plate movements are occurring and that certainly is the case for the Nazca and Cocos Plate buoys. ZetaTalk Explanation 11/24/2012: Buoys have proven to be an embarrassment, in that they show the ocean floor rising or falling, and in accordance with our predictions. The death of a Malay buoy maintenance man recently, to silence him, was considered a red flag, so buoys are not being taken out of service when they are flagging plate movement. Being taken out of service does not mean they are no longer operational, it simply means the public cannot be privy to the information. One can read past the outages to see where plate movement is occurring, thus. Just look for the newly deactivated buoys, and draw your own conclusions! What do pulsing buoys charts show? A buoy in alert status just under the folding Mariana Plate on November 28, 2012 shows a rapidly dropping sea level. This part of the Pacific is crumbling, under the pressure of the compressing Pacific, which is the reason for so many little platelets in the region. The Pacific subducts under Asia at this point, thus during compression, would drop in sea level. All this is something you are not to see, per the establishment, else you might suspect that the ZetaTalk 7 of 10 plate movements are occurring. ZetaTalk Prediction 11/27/2010: The folding of the Pacific plates that accompany the sinking of Indonesia during the 7 of 10 scenarios involves, as we have explained, the Mariana and Philippine plates tilting and flattening westward. The Mariana Trench is a zone where the Pacific Plate is subducting under the Mariana Plate. The Pacific Plate curves down at this point, plunging under the Mariana Islands which ride on the Mariana Plate. The Philippine Plate likewise tilts its eastern side up, dropping its western side down. 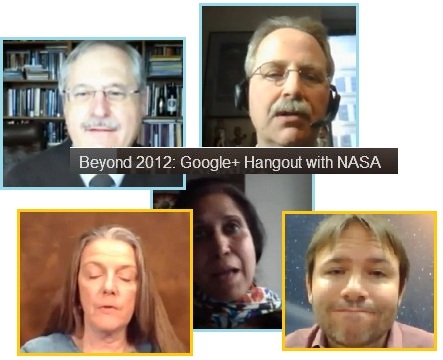 On November 28, 2012 NASA held a Google Event, streaming video to all who wished to attend, to discuss why the world will not end on December 21, 2012. - Andrew Fraknoi, science educator from Foothill College in Los Altos Hills, Calif. Global Warming and rising seas (apparently the only real worry)! And of course, that beast, Nancy Lieder, whom David Morrison advised the public to find on Wikipedia, where the beast is also mistreated via disinformation claiming that ZetaTalk says a collision with Earth will occur. David Morison and Don Yeomans, who previously attacked Nancy Lieder (and only Nancy Lieder) by name were both at the helm here, and did not disappoint. They took pains to explain that the whole Planet X thing emerged in 1983, was based on what the ancient Sumerians had to say, and if it were out there as claimed “we would all be able to see it”, it “would be very bright” and “anyone could see it”. Also, its gravity would “interfere with the other planets”. Apparently he has not noticed the plethora of photos being posted daily on the Pole Shift ning, Alberto’s amazing photos, and the obvious Earth wobble. What is the origin of the prediction that the world will end in December 2012? The story started with claims that Nibiru, a supposed planet discovered by the Sumerians, is headed toward Earth. Zecharia Sitchin, who writes fiction about the ancient Mesopotamian civilization of Sumer, claimed in several books (e.g., The Twelfth Planet, published in 1976) that he has found and translated Sumerian documents that identify the planet Nibiru, orbiting the Sun every 3600 years. These Sumerian fables include stories of "ancient astronauts" visiting Earth from a civilization of aliens called the Anunnaki. Then Nancy Lieder, a self-declared psychic who claims she is channeling aliens, wrote on her website Zetatalk that the inhabitants of a fictional planet around the star Zeta Reticuli warned her that the Earth was in danger from Planet X or Nibiru. This catastrophe was initially predicted for May 2003, but when nothing happened the doomsday date was moved forward to December 2012. Yeomans noted that well-known UFO aficionado Nancy Leider, who describes herself as being in contact with aliens from the star system Zeta Reticuli, first said Nibiru would cause widespread disaster in May 2003, only to later change her prediction to Dec. 21, 2012. 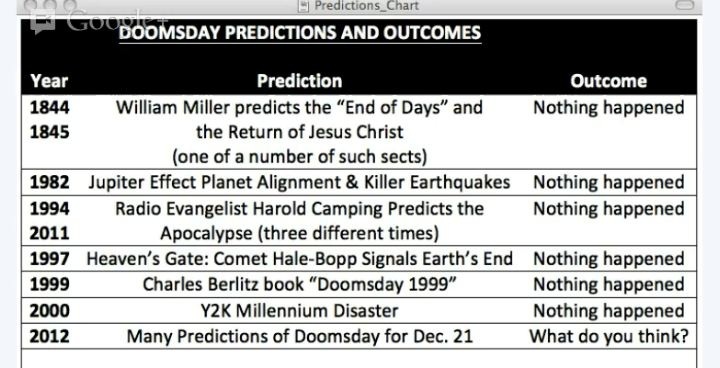 Oddly, they did not list the 2003 missed date of the passage in their list of failed doomsday predictions, though Morrison could not resist lecturing those who “scare children” with stories. Perhaps he has a short memory and could not remember the solar flare stories that NASA spread these past few years. The worst storms can knock out power grids by inducing currents that melt transformers. Modern power grids are so interconnected that a big space storm - the type expected to occur about once a century - could cause a cascade of failures that would sweep across the United States, cutting power to 130 million people or more in this country alone. Outages could take months to fix, the researchers say. Banks might close, and trade with other countries might halt. Some scientists expect the next peak to bring more severe events than other recent peaks. The report was commissioned and funded by NASA. National power grids could overheat and air travel severely disrupted while electronic items, navigation devices and major satellites could stop working after the Sun reaches its maximum power in a few years. Senior space agency scientists believe the Earth will be hit with unprecedented levels of magnetic energy from solar flares after the Sun wakes "from a deep slumber" sometime around 2013. The new forecast suggests the solar storm could be at its peak activity in 2012 or 2013. The sun has been particularly quiet for the last few years in a protracted solar minimum. It has just woken up, as it were, and started its usual 11-year cycle a bit later than most. There were two solar experts on the November 28, 2012 event, which took pains to explain that the Sun had a mild solar minimum, with few sunspots, and a mild solar maximum too. Also, that since they peek at the Sun from the Stereo cams, they can reassure the public that no mega-flare is about to emerge from the backside of the Sun. Morrison and Yeomans did not apologize for all the scare tactics used recently, but rather Morrison lectured repeatedly “those” who used scare tactics to frighten children so they contemplate suicide. Why this emphasis? I suspect he is trying to pre-educate the public, so that when the truth about Planet X is revealed they will remember the very caring David Morrison, who only worried about the sensibilities of children. If the current plan is to have NASA lead with the admission that Nibiru, aka Planet X has been near the Sun for years, they why continue to debunk Nibiru and Nancy Lieder? Per the Zetas, to do otherwise would be a pre-announcement. ZetaTalk Comment 11/28/2012: NASA is still officially on record with the same stance – Nibiru as described by Nancy and the ancient Sumerians does not exist and the Planet X hype is a hoax. They day before their November 28, 2012 public forum on the December 21, 2012 date ending they are still making the same noises, and linking to Phil Plait of Bad Astronomy and other debunking sites. For someone who is about to make a ‘breaking news’ announcement, this seems oddly contrary. Will they just suddenly come forth and say “it was lies, all lies, all along”? Yes, this is exactly the plan. To do otherwise is to in essence make an announcement before the announcement. NASA expects an explosion of rage and bewilderment when they make their planned announcement, which will indeed have little warning and be titled “breaking news” or some such indication the news has never before been heard, at least from NASA. They plan to only talk to family after the announcement, astronomers and others in the field, not accepting questions from the public for some time. A grieving process is expected. They will ensure they are unavailable for the torrent of rage and bewilderment, hoping it subsides and is directed elsewhere, needing an outlet, toward perhaps the Obama administration. Those who have observed NASA’s history of blaming the Sun, anticipating a horrific solar max, are in shock at the present stance, which is an admission that the cycle was mild, with few sunspots, and the solar max mild too. No apologies for their scare tactics. Likewise the excuses such as the Galactic Center alignment, or potential asteroid impacts, which have been trotted forth to scare the public as the cause of disaster in 2012. Where was their silence all these years? Yet Morrison is happy to cite his concerns over suicide urges in young people terrified by those spreading rumors. Does he look in the mirror? The chat was clearly to debunk every excuse for a catastrophe at the end of the Mayan calendar. This chat, and its timing, was to discount many of the scare tactics employed by NASA and the cover-up crowd in the past, prior to the announcement. They hope for good coverage, so the public can be reassured, and hope to distance themselves from the scare tactics they themselves employed. A preview of the content of what they intend to deliver is evident also – pole shifts are not the end of life, there is no collision that will occur, the Sun will not explode or deliver a kill shot, rising seas are our immediate concern, and the magnetosphere is not going to disappear. They also described a pole shift in some detail, even to describing a rotation interference, and that a “large body” would be required to effect such an event. Stay tuned for the next few public messages. 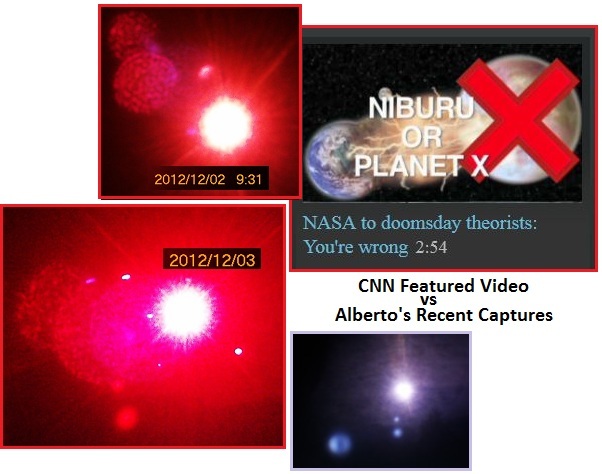 Certainly CNN was happy to showcase the NASA event, leading with the explanation that Nibiru, aka Planet X, was debunked. This was a featured video starting on December 3, 2012. Certainly the term Nibiru and Planet X are getting more exposure. But if the world of NASA lies is to take a sudden reversal shortly, with an official admission that Nibiru is right next door in the inner solar system, NASA will be getting whiplash. 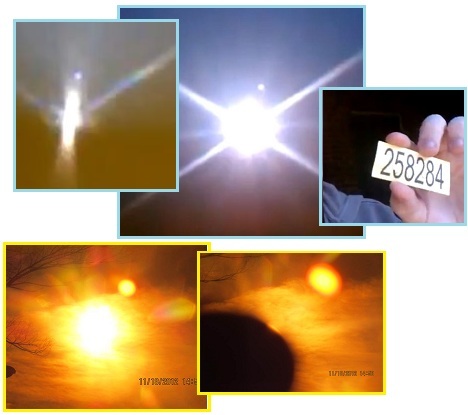 Planet X can be seen naked eye at dawn and dust as a Second Sun on occasion, and can be seen at any time when a welders lens or the insert from a floppy disc is used as a filter, filtering for light rays in the red spectrum, as the endless photos on this Pole Shift ning blog show. But lately the intensity of light from the Moon Swirls is allowing captures of the brilliant Moon Swirls with the glare of the Sun reduced only by clouds or paper! Compare snaps from this video taken on November 11, 2012 in Cincinnati, Ohio behind a piece of paper to Red Filter snaps taken in Idaho on November 18, 2012 where the glare of the Sun is hidden by a finger. 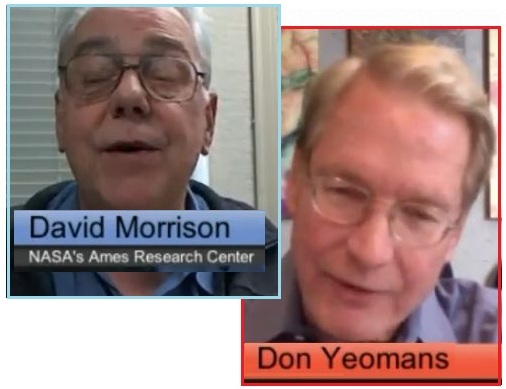 If the Moon Swirls can be seen through only a paper filter, can what David Morrison of NASA says is the criteria for an admission that Planet X is in the vicinity be far behind, i.e. “we would all be able to see it”, it “would be very bright” and “anyone could see it”. Take out a piece of paper and give it a try!